The Project Maths Performance was a collaborative project between Music Generation Wicklow, Music Generation and the Department of Education and Skills. 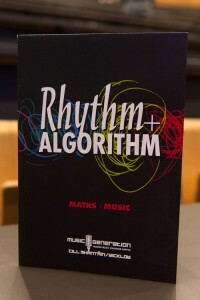 The idea from this project evolved from the established correlation between Maths and Music. From metre, rhythm, random selection, harmonics, repetition, built chordal patterns the possibilities are endless! The Department of Education through Music Generation has given us this opportunity to celebrate this relationship between maths and music and provide a really exciting and accessible experience for the young people of Scoil Chonglais, Baltinglass. Composer Andrew Synnott conducted workshops and exploration sessions with the students from Scoil Chonglais, supported by five Music Generation Wicklow tutors. Together they explored the connections between maths and music, and selected a notion on which the composition could be based. The students were invited to perform at a National Conference for Project Maths held in the National University of Ireland, Maynooth on Friday 15th November 2013. Forty Students from Scoil Chonglais and five professional musicians from Music Generation performed the original composition which was attended by the Minister for State Sean Sherlock.